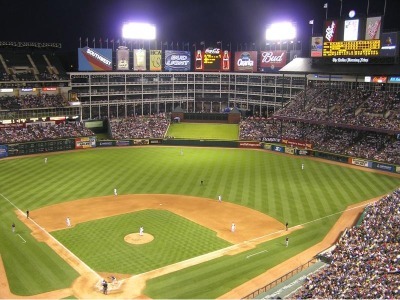 Mary Helen's Blog: "sic em rangers"
FINALLY. Thats the word on everyone's minds when it comes to the games this past weekend. The Texas Rangers finally pulled out an ALCS championship against the New York Yankees. We're finally going to the World Series. 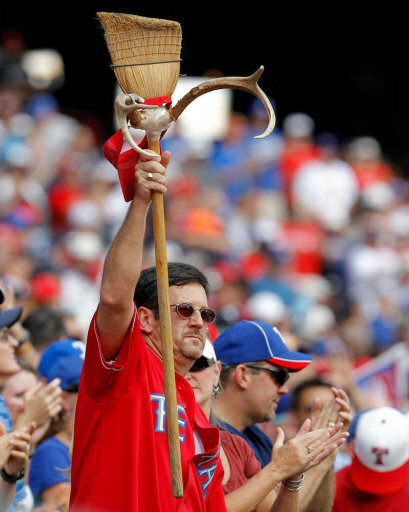 The Rangers have got their act together and the fans all throughout Texas are beside themselves. With such a huge win against the Yankees and a trip to the world series just around the corner, the rangers PR team really doesn't have much work to do. They can advertise the World Series as much as they want but fans are going to watch no matter what. The "claw" phenomenon is a gesture Ranger's utility man, Esteban German, came up with when the Rangers were playing in Oklahoma City last season. The hand sign has become a part of the Rangers culture that is now known across the country. German said "we started doing it in spring training if a guy would get hit. it's very cool. it's like a long distance high-five." 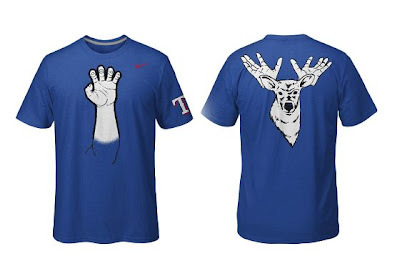 The claw and antlers started off as an inside joke between Nelson Cruz, who has a deer hanging above his locker for inspiration, and his teammates. 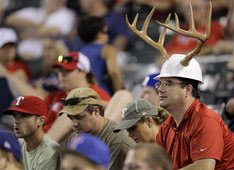 To everyone's surprise the gestures became so popular there's a "claw cam" and a "deer cam" between innings to catch fans showing their support throughout the game. What started out to be a funny gesture between teammates has turned out to be the #1 PR tactic imaginable. Josh Hamilton, Ranger's 2nd baseman, had a rocky past with alcohol abuse and when the ranger's won on Friday people began to wonder how he'd go about celebrating. In true Ranger's fashion, the team decided to celebrate with ginger ale instead of champagne so every player could be included during such a special moment. This created a great image of teamwork and loyalty between the teammates, which also contributed to their PR efforts. A good image can go a long way and the fact that they cared enough about his past to respect the present moment said a lot about the team morale and their individual characters. My point in all of this is to show how PR can used without effort; the Ranger's have created their own publicity without even knowing it. On to the Bears. This weekend we beat Kansas State, which makes us bowl eligible for the first time since 1995. This is a HUGE deal for students, alumni, coaches and of course the players. Baylor stats have been all over ESPN, the internet, the Baylor website, Twitter, Facebook statuses and the news. Not only is this a big win for the athletic department, but it's a big win for the PR department. I have friends on facebook who graduated years ago who have uploaded a picture of the polls, which shows Baylor is ranked #25 in the nation. BaylorProud on Twitter has posted statistics, fun facts and poll results ever since the game ended Saturday night. There are blogs, news reports and e-mails being sent around with the good news. 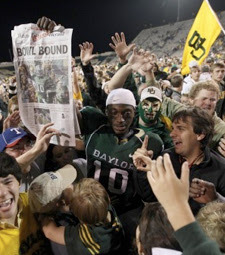 Social media is playing a massive role in Baylor's PR efforts and the football team has gotten more attention in the past 48 hours than in the past 10 years. The Texas Rangers and the Baylor Bears are two teams who have been highly underrated, yet highly followed for the past 20 years. They're both teams who everyone wants to do well but can't ever seem to get there. They've put endless amount of hard work into achieving something great, and they've finally reached their goals. The Ranger's and Bear's victories this week aren't just great for the time being, these two games will be remembered forever. It's the Ranger's first trip to the World Series in franchise history and it's also the Bear's first trip to a bowl game in over 15 years. The PR departments for both teams can take a step back, breathe and let the publicity take the reigns.